We are the leading manufacturer, exporter and importer of Disposable Shoe Cover. We are offering an excellent quality of PE Shoe Cover. Offered shoe covers can be used as an indoor shoe cover protecting carpets and floors from the outside. These shoe covers are made from embossed plastic to prevent slipping. 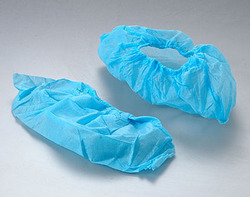 These shoe covers are waterproof and feature an elastic band opening for universal fitting. We provide these PE shoe covers to our customer’s at equitable market rates. Packing 100 pair in a polypack , gunny bag 10x100 pair,20x100 pair. Owing to the expertise of our team of experienced professionals, we are able to introduce an exclusive range of Non Woven Shoe Cover. This cover looks awesome and comfortable when worn over the shoes. 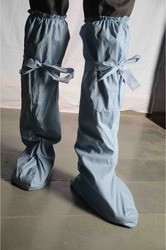 Operation Theater, research centers, server rooms are places where such cover is worn over the shoe to stop dust and unhygienic particle entering the room. The quality monofilament and the strong stitching make the cover highly durable and attractive. With the years of experience and expertise, we are involved in offering a quality range of Long Shoe Cover.